Incentivize users for taking actions that matter most. 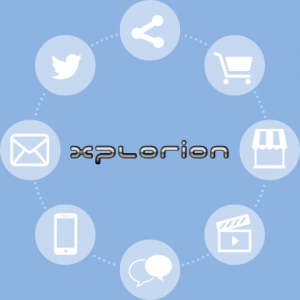 XPLORION is the world’s first instant loyalty and rewards platform allowing bloggers, brands, and businesses to create free social and mobile-enabled loyalty programs in minutes. Through the XPLORION platform, consumers earn points for engaging on your websites and sharing your content on social networking sites like Facebook and Twitter, redeemable for discounts and prizes from a customized catalog. Users earn loyalty points for various actions they take on your site or application. Your users can earn points on your site in the following ways; a small red ribbon will appear next to supported social sharing buttons and comment boxes automatically. Drive Social Engagement – Keep the conversation going by rewarding users for sharing on social. Increase Traffic – You’re always cooking up new stuff. Encourage users to check it out by offering points for daily visits. Get More Subscribers – By rewarding users for sharing, they do the marketing for you. Free Rewards – The rewards are on us. When users redeem their points for prizes, we foot the bill and send them out. Keep the conversation going by rewarding users for sharing on social. You’re always cooking up new stuff. Encourage users to check it out by offering points for daily visits. By rewarding users for sharing, they do the marketing for you.